This is a special time for women in golf in Chicago. As executive director of the Illinois PGA, Carrie Williams is one of only four women (out of 41) to head a section in the PGA of America. Carol Rhoades, who teaches out of Cog Hill, was recognized as the 2017 Illinois PGA (IPGA) Professional of the Year. 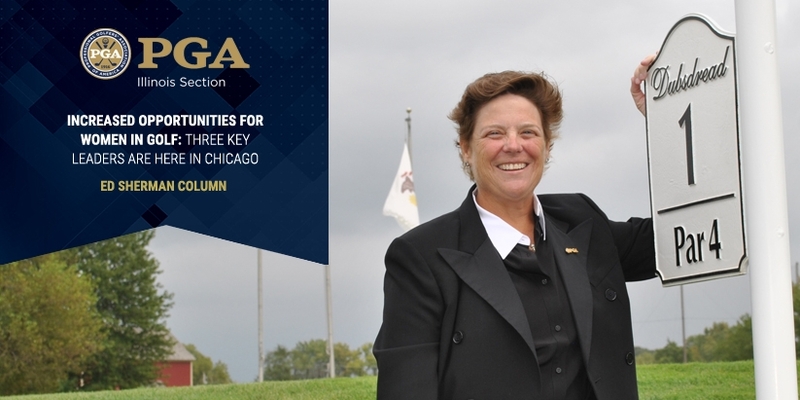 Lisa Quinn is the executive director of the Chicago chapter of the First Tee, which introduces the game to more than 50,000 aspiring young golfers in the area. It goes beyond Chicago. On a national level, Suzy Whaley is set to become the first woman to be president of the PGA of America in November. “I think there are tremendous opportunities for women in golf right now,” Quinn said. The goal is to keep the pipeline flowing. Grow the numbers by encouraging young women to think about careers in golf. Then they will be able to follow in the footsteps of Williams, Rhoades, Quinn, Whaley and others. “The number of opportunities is increasing because so many organizations, including the PGA of America, are placing an importance on diversity,” said Williams, who notes two of the three IPGA interns are female. Indeed, Rhoades reflects back on when she started her career more than 25 years ago. Back then, there were very few women involved in golf. In fact, it was a time when more than a few courses had restricted tee times for women. “I don’t even want to go back to that one,” Rhoades said, shuddering at the thought. That is why Rhoades is pleased with the positive developments with women in golf in 2018. A case in point is Williams, who assumed her current role in 2015. She admits she isn’t always comfortable with references noting her gender in stories about her being one of the top golf administrators in the state. Yet Williams knows there is one area where her gender is of prime importance: Serving as a role model to young women. They can look at Williams and believe a similar career in golf might be possible for them too. Rhoades did not have a female role model when she started her career. So in a sense, she defied the odds to get to her status in golf. Looking back, she knows it would have been easier if other women had charted a path before her. Quinn is involved with First Tee programs that expose young girls (and all participants) to possible careers in golf. She, along with Williams, will attend the Women’s Leadership Summit that will be taking place during the KPMG LPGA Championship during the week of June 26 at Kemper Lakes. Again, it gets back to the importance of seeing and interacting with women role models like Quinn and others. Rhoades said one component of the First Tee program includes teaching young girls the role golf plays in networking within the executive levels of companies. While there has been considerable progress made, there still is room for growth for women in golf. Quinn would like to see more women in roles of general managers and executive positions in golf. She thinks there are terrific opportunities for women to become teaching professionals. She contends they would have a built-in clientele. Williams noted that the PGA of America is trying to recruit players at the NCAA golf championships for possible careers in the game. That includes connecting with women players who might be interested in making golf their life’s work. Williams became hooked when as a teenager she worked in the pro shop of the course she played on in Cincinnati. The rewards, she says, go beyond earning a salary.